Retractable banner stands and pop-up banner stands are a simple, effective and very portable way to display your message. Banner stands are great for a wide variety of applications, including trade shows, point of purchase, retail, restaurants, exhibits, conferences, road shows and corporate presentations. Pop-up or retractable banner stand displays are popular because they are the perfect lightweight and compact way to display your products or services. Because pop up banners don't require any tools they can be set up in seconds and deliver a professional message. When your show or event is over, simply collapse the pop up banner stand and you're off to your next destination. If you decide to change your message or product offering before your next event simply have QPS print a new graphic and insert it into your pop up banner stand and you're good to go. They look great standing alone in front of your store or as part of your trade show booth. Pop up banner stands get noticed and help attract customers! 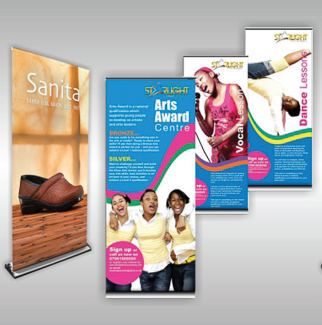 So stop lugging around large and heavy mounted boards and switch to pop up banners and retractable banner stands by QPS.